So far on my 14" Rockwell Delta Lathe, no special bearings. Most are 202's, 203's and like. Even if you have to drive it out by inner race, if it comes out damaged, should be easily replace with a standard bearing. 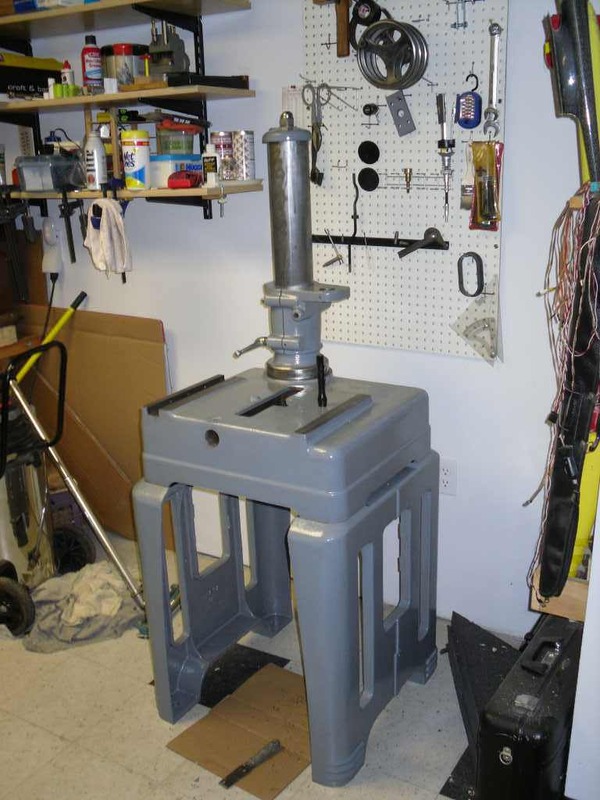 It's been too many years ago since I took apart the Delta Tool maker grinder dad had and scrapped it. Wished now that I kept it. Good to know. Thanks Ken, it will make me feel better knowing if I wind up pushing it out by the center race. I just don't want to brinnel the balls if possible. Ok, so I milled an oil groove into the cross slide where it had been worn away. Now measuring the height different between the 2 sides and it is 10 thou. I don't have a long enough travel on my table to do this in one pass, and am afraid if I do take it down, it will not be level if I do 2 passes. I don't scrape. And the surface grinder won't help because it will not reach this area to correct. Anyone have an idea how to take the surface farthest from the lens down 10 thou w/o enough travel? Some more progress. I need the space that the project is taking up, so I started putting the largest pieces together. I have to shim one foot by about 40 thou. I'll need to start ordering bellows for the screws and possibly the mast. I also need to order a large chunk of brass, to turn a new nut for the height adjustment. Holy that would be a lot of work! I've done a similar setup on re-grinding the bed on a 20" x 68" Lodge & Shipley lathe. I've also seen this done on large machine tools where the machine could not be moved easily or transported to a facility to rebuild. Some work I did today on the grinder. Trying to mill the crossslide down ... the wear from one side to the other was 10thou. So I mounted it on my small Clausing 8520... really small when doing large pieces. Used a fly cutter to take it down. Left it 1 thou proud.. figure it will wear in fast due to the roughness. I put a new oil groove back in... oops.. the clamp let go, but I didn't realize it... I kept checking, and it seemed fine, but it wasn't. oh well. I used a grinding stone to flatten the milling. Still a little rough.. I have a carbide scraper for paint, I may use that to level the highs off.. not a true scraping job. What do you think, will it be ok to leave it this rough and let it work it's way in, or keep stoning, or scrape it (total hack ). Scrape it the best you can and then stone it smooth. Submerge your oil stone in mineral spirits and wetted. This will let the stone keep it's shape, kind of sorta, and smooth the high spots out.